The Days of Hebrew Calligraphy took place within the Mystery of the World’s Calligraphy exhibition held at the Contemporary Museum of Calligraphy in the capital. The event was organized by the National Union of Calligraphers and MVK, the International Exhibition Company with the assistance of the Israeli cultural centre in Moscow. The works of two calligraphy masters from Israel Avraham Borshevsky and Izzy Pludwinski were displayed at the special stand dedicated to Hebrew calligraphy among the other exhibits from 26 countries. Avraham Borshevsky, Israeli calligrapher, a famous expert in Judaic sacred texts made a presentation on Kosher Calligraphy subject within the event. The master of calligraphy described Muscovites about the history of Israeli calligraphy, about its laws, peculiarities and characteristics. Moreover, under the leadership of Avraham Borshevsky three master-classes on kosher Jewish calligraphy were held, and two of them were schoolchildren-oriented. A presentation of Borshevsky’s book called Truisms (kosher calligraphy) also took place. 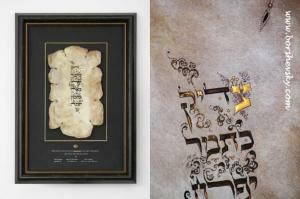 What does a “kosher calligraphy” mean exactly? There are several types of parchment used to write sacred texts. All of them are made of pure (kosher) animals“ leather: cow’s, calf’s or goat’s. The font used in Jewish sacred calligraphy is called Ashuri (ktav Ashuri). It consists of 27 letters (22 principal letters and 5 finals). There are very strict requirements for these texts, but the most severe rules are applied for a mezuzah. Their infraction makes the scroll non kosher (for example, a crack in a letter). Mezuzot and tefillin should only be written from right to left (i.e. in the order the text is read), while a Torah scroll and can be written from left to right. Mezuzot and tefillin can be written from memory, but the Torah scroll must be copied from the sample only. Scrolls are written by hand, it is necessary that the text was written by a human. Bamboo or bird’s quills (usually it is a turkey quill) are used as writing tools. A quill is more elastic, it can produce thin and thick lines as well (bamboo quills make only thick lines without crowns, which are then written separately). There are definitely requirements for the ink structure as well as for a tool and a parchment. Moreover, a special temperature and humidity level is used in order to make the scroll of a better quality. An aesthetic part is not the main thing in Hebrew calligraphy, unlike the Western tradition. It is important the letters to be written correctly, according to all requirements. Although the most beautiful Borshevsky’s works there is an aesthetic origin, of course. 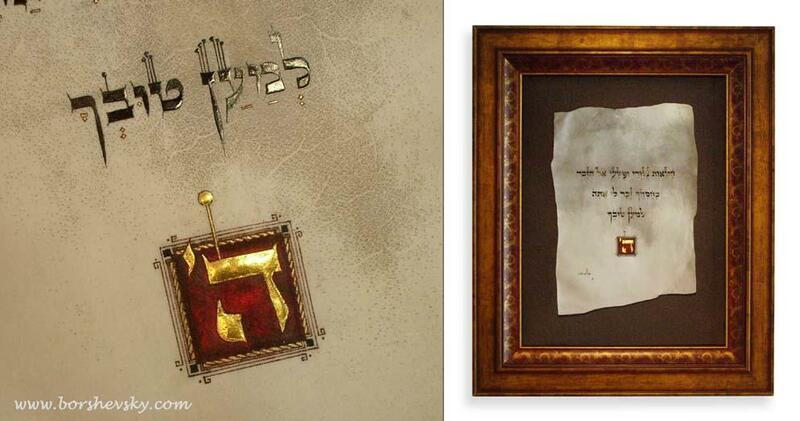 In April of this year, the Jerusalem Torah scribe and calligrapher Avraham Borshevsky managed to create a masterpiece that has impressed the world known experts with its perfection. The case in point is the sacred kosher mezuzah parchment scroll of 94 cm to 76 cm size, which is located in a container of 110 cm height. 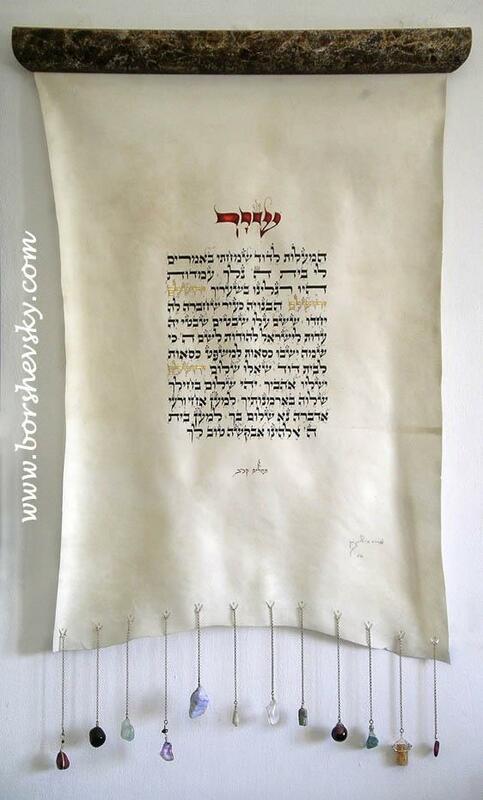 It is made with pen in a special font of striking beauty following strict canons of sacred Hebrew calligraphy with the directions from the Zohar book included. The canonic text of the mezuzah consists of two paragraphs from the Pentateuch (Deuteronomy 6:4-9 and 11:13-21). In fact, this mezuzah is the most unique manuscript among all famous Jewish manuscripts in the whole world, because the whole manuscript is written entirely in large font. 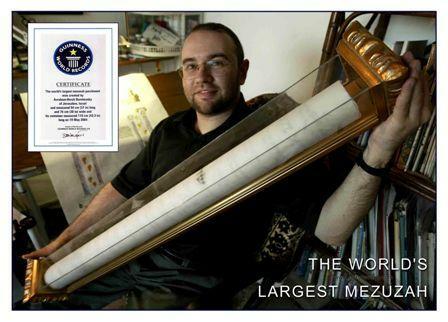 This memorial of Jewish culture is also listed in the Guinness Book of Records as the largest kosher mezuzah ever written in history. The days of Hebrew Calligraphy were organized in Moscow with the participation of Israeli cultural center and with the active assistance of Yossi Tavor, the First Secretary of the Embassy of Israel in the Russian Federation. Since the museum exhibition was timed to the presentation of the handwritten copy of the Constitution of the Russian Federation, the Israeli cultural center presented to the museum the copy of the Israeli Declaration of Independence. Avraham Borshevsky was born in 1970 in Korosten, Ukraine, and grew up in Leningrad (now St.Petersburg) Russia. He received his artistic education from the Department of Architecture of the Leningrad Civil Engineering Institute. Borshevsky became an expert in Judaic sacred texts and a master of canonic Hebrew calligraphy at Jerusalemite Shvut Ami Yeshiva.